Stroke patient and treatment. 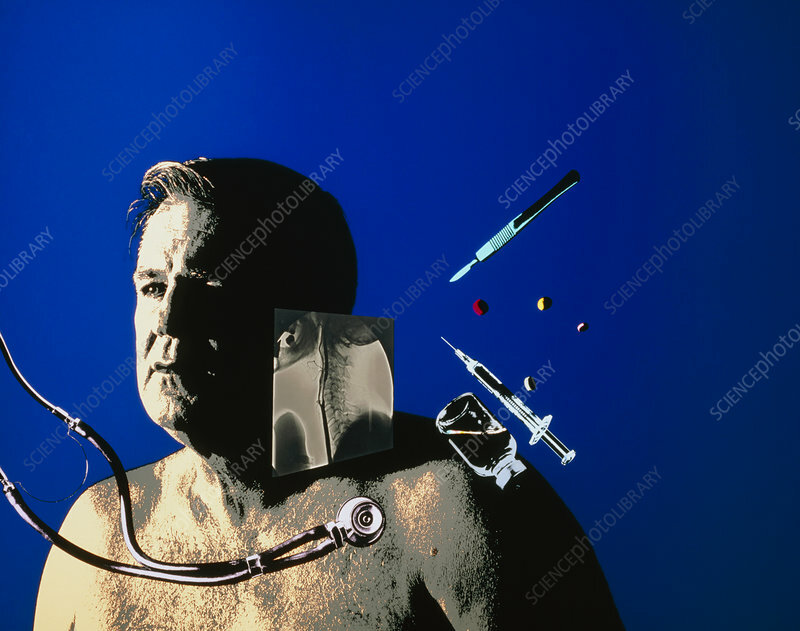 Abstract depiction of a man who has had a stroke (cerebral infarction), the methods to detect this, and its treatment. Stroke occurs due to an interruption of the supply of blood to the brain. The angiogram X- ray shows the skull, neck vertebrae, and carotid artery passing up the neck. The thicker branch of the carotid artery shows an occlusion (blockage), a common cause of stroke. A stethoscope (at left) detects heart disease or defects which are also a cause of stroke. Stroke may result in coma or paralysis of movement or sensation. Surgery may be necessary to remove a blood clot from the brain; anticoagulant drugs and aspirin may be prescribed.